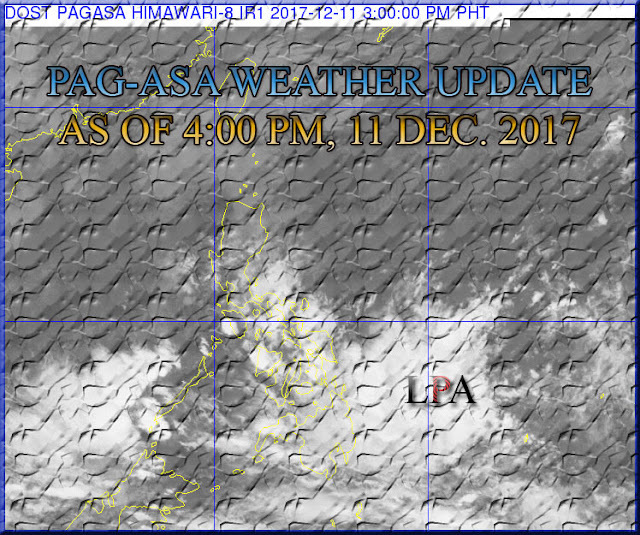 Home Amihan La Niña LPA Northeast Monsoon Tail-end Tail-End of a Cold Front Weather PAG-ASA Weather Update as of 4:00 PM today, 11 December 2017. PAG-ASA Weather Update as of 4:00 PM today, 11 December 2017. As of today, 11 December 2017 - there is A Low Pressure Area (LPA) estimated based on all available dat at560 km East of Hinatuan, Surigaodel Sur (8.0N, 131.4E). Tail-End of a Cold Front affecting the eastern section of Southern Luzon. Northeast Monsoonaffecting Northern and Central Luzon. Trough of a Low Pressure Area will bring Cloudy skies with light to moderate rains in places of Mindanao, rest of Visayas, Mindoro, and Palawan. Tail-End of a Cold Front will bring Cloudy skies with moderate to occasionally heavy rains in places of Bicol region, Eastern Visayas, and the province of Quezon. Cagayan Valley, Cordillera Administrative region and Aurora province will will experience Cloudy skies with scattered rains due to Northeast Monsoon. Metro Manila and the rest of Luzon will have Partly cloudy to cloudy skies with isolated rains due to Northeast Monsoon. PAG-ASA Weather Update as of 12 December 2017. URDUJA is the next name if LPA fully develops. Continue Reading: LA NIÑA WILL BRING MUCH RAINFALL DURING THE REMAINING PORTION OF THE YEAR AND FIRST QUARTER OF 2018.